NOTE: A shorter and different version of this account appears in my recently published history of civil legal aid—TO ESTABLISH JUSTICE FOR ALL: The Past and Future of Civil Legal Aid in the United States (Praeger, 2014). The following draws heavily on events reported in several chapters of Scott Stossel’s excellent biography of Shriver’s life and career—SARGE: THE LIFE AND TIMES OF SARGENT SHRIVER (2005), while also including information from some other sources and my own personal experiences with him while he was the OEO Director and I was directing and some other sources. Once Lyndon Johnson decided he wanted to wage and win a war against poverty and declared that war to the nation in his 1964 State of the Union address, he next had to choose a Commander in Chief to plan and execute the campaign. After only a short period, the President settled on Sargent Shriver, then the charismatic director of the highly successful Peace Corps he had launched from scratch three years earlier. From President Johnson’s perspective, Shriver had many pluses—among them, a proven record in taking a new program from concept to reality and a connection to the glamorous Kennedys without really being one of them. But Shriver also had pluses for those interested in adding a legal services arm to the war on poverty, plusses no other likely choices for that position would have had. 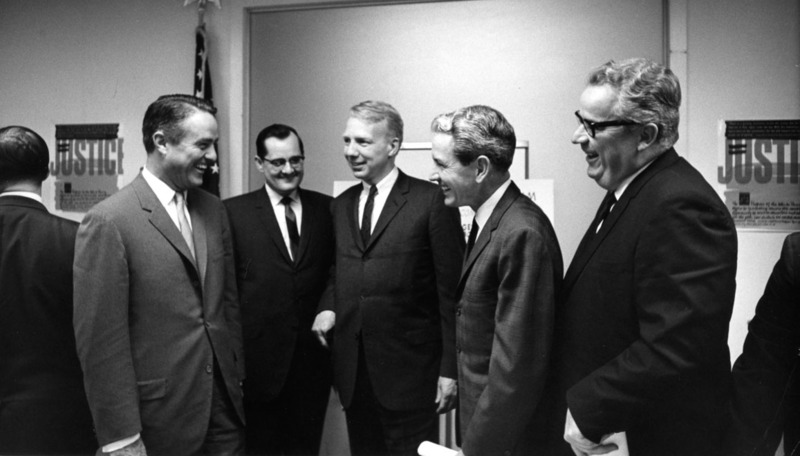 Press conference announcing Houston Legal Services Program, April 1966: Sargent Shriver; Unknown; Clinton Bamberger (first director, OEO-LSP); Sam Johnson (Houston Legal Services); Unknown. Photo: Clinton Bamberger photo collection, National Equal Justice Library, Georgetown Law Library; photographer unknown. Because he so quickly became a businessman after law school, it is easy to overlook the fact Sargent Shriver started out as a lawyer and always thought of himself as one. In fact, as a Yale Law graduate he had no trouble landing a job at a Wall Street law firm when he returned from World War II after service as a naval officer on a battleship and a submarine. It is because Sarge found little value or interest in his work as an associate serving business interests that he soon left the law firm for an editorial job at Newsweek magazine. He had the credentials for that job, too, because as an undergraduate at Yale, he had been the editor in chief of the university’s newspaper. But he left Newsweek after a few months when Joe Kennedy Sr. asked him to look over his late son Joe Jr’s papers for a biography he hoped to see published. That request came after Sarge’s first date with the elder Kennedy’s daughter, Eunice, who told her father that Sarge was an assistant editor at the magazine. Soon the senior Kennedy recognized Shriver had other talents, too, and offered him a position as assistant manager in his latest business venture, the Merchandise Mart in Chicago, a failing enterprise he had recently acquired. But Joe Kennedy Sr. wasn’t done asking Sarge to shift roles. In the meantime, his daughter, Eunice, had taken a position in government—as head of a new Committee on Juvenile Delinquency in the U.S. Department of Justice then Attorney General Tom Clark had established. Kennedy dispatched Shriver to “help Eunice” in her new assignment and paid his salary while he was a “dollar a year” employee serving as her deputy at the Department of Justice. This job proved to be a nearly perfect preparation for Sarge’s future role as director of the Office of Economic Opportunity. In the year they were at the Justice Department, Eunice and Sarge planned a multi-pronged, multi-disciplinary, local community-oriented attack on juvenile delinquency. They were impatient to put their ambitious program into action and soon frustrated by the many bureaucratic obstacles to implementing that plan. After a year, they resigned from the Justice Department—Eunice to travel and work on other passions, Sarge to become the Merchandise Mart’s director and a major figure in the Chicago business and social community. Four years later, when Sarge was 37, Eunice Kennedy became Mrs. Sargent Shriver. From that moment on, Sargent Shriver’s fate – for both good and sometimes not so good–was tied to the Kennedys. Fast forward to February, 1964. After Shriver proved a loyal and effective campaigner in his brother-in-law’s presidential campaign he then proved himself a charismatic, energetic, imaginative and highly successful leader of one of the Kennedy administration’s signature programs—the Peace Corps. As Sarge was returning from a month long trip reviewing Peace Corps stations in Asia, he was met at the gangway by the agency’s general counsel bearing gifts—two thick briefing books on President Johnson’s new War on Poverty initiative. This was his “draft notice” that Johnson wanted him as the general of his own personal initiative, this War on Poverty. When Shriver arrived back in Washington, he received a call from the President informing him that there would be a news conference in a couple of days at which Johnson was announcing Shriver would be heading the War on Poverty. Shriver tried every excuse for why that shouldn’t happen. After all, he was still directing the Peace Corps and couldn’t abandon that program midstream. Neither the President nor anyone else wanted that landmark and popular venture to falter. Johnson’s answer was short—you can run both. No matter what objection Shriver voiced, Johnson persisted. The President even tried appealing to Shriver’s pride by saying most of his advisors didn’t think Shriver was the man for the job—good at PR but not at running a program. But he, the President, was confident he was. So, on a Saturday in early February, 1964, without having ever said yes, Sargent Shriver listened to a press conference at which he was named the man responsible for leading the nation’s War against Poverty. The next day, a Sunday, he spent all day as a draftee not a volunteer beginning the difficult task of creating Johnson’s new program. That Johnson chose Shriver to head the War on Poverty was critical for the prospects of including a legal services component. For one, he was a lawyer while many other possibilities were not. Second, he was not a bureaucrat, as many logical contenders were. Third, he was not an elected official or a former one, overly concerned with political consequences, which other conceivable candidates might have been. Fourth, while he wanted local community planning and action, he was not a community action purist, unlike many who were part of the team planning the War on Poverty. He knew from his Peace Corps experience that if he were to maintain Congressional support beyond the first year he needed early successes and ideas that would capture the nation’s attention. Shriver told President Johnson about this proposed “Head Start” initiative and Johnson loved it, saying they should double its size. But how to fund that program under the legislation they had managed to pass? Most of the available funding was in the Community Action Program section of the OEO budget. But the “head start” idea had not originated in local CAP programs nor had scores or hundreds of those local groups flooded OEO with requests to start their own early education projects. Yet both Shriver and the President were convinced this was just the sort of program that fit the underlying goal of lifting people out of poverty—equipping a future generation with the knowledge and skills to join the mainstream economy. Shriver’s solution was to superimpose on the community action program what he called “national emphasis programs.” These were to be nationally designed and promoted programs that local community action agencies were encouraged to adopt and adapt—that is adopt the basic concept but adapt it to their local situations. This made Shriver receptive to new ideas for other national emphasis programs– which put him at odds with community action purists, many of whom were on the senior staff at OEO. They tended to resent the “national emphasis programs” and the incursions they made in the overall CAP budget. But it also helps explain how Shriver became so excited when he read an article to appear in his law school’s law review, written by two young lawyers and outlining a new vision for what lawyers could do to improve the economic and social prospects of poor people That article, of course, was Edgar and Jean Cahn’s Yale Law Review article, “The War on Poverty: A Civilian Perspective.” Shriver stayed up until 2 AM reading it and called the Cahns early the next morning telling them to come to his office. Within the week, Edgar was Shriver’s special assistant and speech writer and Jean was an OEO consultant charged with the responsibility of putting together a new “national emphasis program”, a legal services program. That program had a long gestation period–a full year before it had a director and was in operation—but from that moment on it was part of the War on Poverty. Whether any other OEO director would have been so receptive to devoting a slice of OEO’s Community Action Program budget to a legal services program seems doubtful. Not many would even have been willing to deviate from the community action purist position that all wisdom and all ideas resided at the local level or started the “national emphasis programs” that became the centerpiece of Shriver’s War on Poverty. Several other such programs were to come into being—among them, “Upward Bound” which encouraged and supported low income high school students to enter college, and “neighborhood health centers” which gave poor people ready access to health care. There is another sense in which those interested in legal services for the poor should thank Sargent Shriver for having agreed, reluctant as he may have been, to serve as OEO’s first Director. He understood and supported the role of legal services lawyers as loyal advocates for the interests of their clients and the need for independence from outside pressures, political or otherwise. Two incidents illustrate his commitment. In the Spring of 1966, the grant proposal for California Rural Legal Assistance (CRLA) was under consideration at OEO. As might have been expected, most rural bar associations opposed the opening of CRLA offices in their counties. But what might seem unusual now, given the strong support the State Bar of California has given legal services programs over the years, in 1966 the Bar’s board of governors passed a resolution telling OEO it should not fund this program. After striking out with OEO-LSP director Clint Bamberger, the Cal Bar’s then president, John Sutro, called Shriver himself to register his personal opposition as well that of the association he headed. Sutro was not just the Cal Bar President but one of the state’s preeminent lawyers, the leading partner in one of San Francisco’s largest corporate law firms. Sutro told Shriver that if OEO made the grant to CRLA, it would be funding one side of an economic struggle between growers and farm workers. Shriver’s reply, “Well, If the members of the California Bar Association will stop representing the growers, OEO won’t provide lawyers to represent the farmworkers.” Sutro had no good answer to that point. Shortly thereafter, Bamberger and Shriver signed the CRLA grant. And, a year later, the State Bar of California supported CRLA’s refunding proposal. That was the kind of War on Poverty director Sargent Shriver was—and the kind the OEO Legal Services Program needed if it were to come into existence and be able to perform its role, the role of the lawyer, in that difficult and controversial endeavor. Earl Johnson, Jr., Visiting Scholar, University of Southern California Law School and the Western Center on Law and Poverty. He is the author of: To Establish Justice for All: The Past and Future of Civil Legal Aid in the United States (Praeger, 2014). Johnson, who had served as the Deputy Director of the Neighborhood Legal Services Project in Washington, DC since 1964, was chosen to be the first deputy director of the Office of Economic Opportunities Legal Services Program in October 1965. Eight months later, Johnson succeeded Clinton Bamberger in that position, and served as director of the OEO Legal Services program until July 1968. This entry was posted in General, History of Legal Services on April 3, 2014 by Katharina Hering.